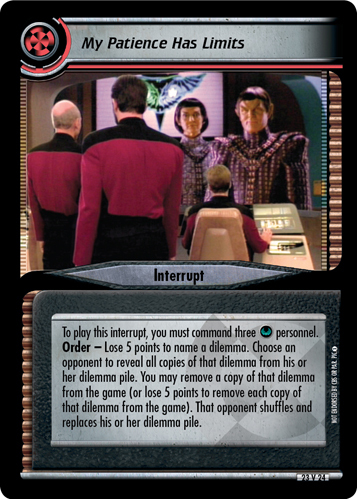 As of late, competitive Romulan decktypes have been pigeonholed into one of two, not necessarily exclusive categories: 1) Far-Seeing Eyes lockout; or 2) Wariness late-game solving. However, both these strategies take a long time setting up, and require a multitude of card combinations to reach effectiveness. As a result, these decks tend to be bulky, slow, and inconsistent. Making matters worse, Romulans struggle completing missions – getting hammered by popular dilemmas such as An Issue of Trust and Gomtuu Shock Wave, while having limited built-in kill prevention to counter Tragic Turn. Extreme Measures introduces My Patience Has Limits and Donatra (Honorable Commander) for all you Romulan deck-builders that bleed green, but hate dilemmas. Let's first look at My Patience Has Limits. For five points you can remove any single dilemma from the game. For five additional points you can upgrade the effect to remove each copy of that dilemma from the game. This is Ohhhh! Nothing Happened! on steroids. However, even with the Romulan's access to bonus points, the cost is not cheap. You will want to make sure it cannot be prevented by using Tal (Alert Subcommander) or Secret Agenda; and you probably do not want to blindly name a dilemma – so use Ptol for scouting. Once you get out and start attempting missions, you will no doubt run into some dilemmas that you were not able to remove from the game. This is where the new version of Kirk, I mean Donatra, comes in. Legacy? Not this time. Necessary Execution? That's too bad. Donatra (Honorable Commander) is one mean, green, dilemma-busting machine. For five cost, she is not cheap. But there are ways to get her out at a discount, or perhaps using the ultimate surprise. Both, My Patience Has Limits and Donatra (Honorable Commander) could seamlessly be inserted into the popular Romulan decktypes. However, some new decktypes could emerge. Perhaps the most intriguing deck is one based upon removing numerous skill-based dilemmas with the cards mentioned here as well as The Perils of Peacemaking, using Donatra for the remaining non-skill dilemmas, and pairing this deck with a Legacy-based dilemma pile. Another option is "Romulan cadets". Essentially this build is a Romulan solver using all of the cheap, non-unique Remans and stooges from Necessary Evil; then using Donatra to bypass dilemmas that beat on cheapies, such as In Development. Either way, the Empire looks like it may be coming back. Catch these new toys in Extreme Measures!